We get quite a few emails about transponder timing systems, so this page has been created to give some information that a club/track might find useful. Three companies produce systems designed to automatically time/score RC cars, other systems are available but are for personal use or mini scale (min-z etc). AMB have been the market leader in this sector since the early 80's when they invented a timing computer and then a transponder timing system for model cars, they now produce systems for all kinds of sports (there is a history on their web site). The System 20 (called this because it can count twenty cars) was introduced in the early 90's, these are no longer made but are available on the second hand market. The basic system can count 10 cars but with an additional box can count 20, many earlier systems sold by AMB (8300/8800 models) could be converted to use system 20 transponders and many of these systems are still used today. Only rechargeable transponders were available for system 20, a club/track will normally have two sets( one for the current race and a set to be given out for the next), of course some drivers forget to return transponders which causes problems. AMBrc systems were introduced in the year 2000 to replace the popular System 20, the new system introduced the ability to have personal transponders as well as handout rechargeable's (System 20 transponders will not work on AMBrc systems or visa-versa). Every driver can now have a transponder permanently installed in their car powered by the onboard electronics (3rd channel or battery connector), removing the need to take and return a track/club one. 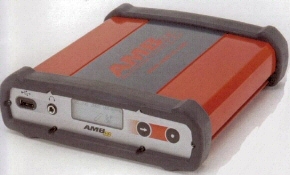 AMBrc3 decoders were introduced in mid 2006 and use the same "Red" transponders as the AMBrc system. The front of the unit has an LCD screen, two buttons to edit settings, a headphone socket and a USB A Socket that is disabled at the present time. At the rear there is a power socket, 10/100 ethernet connection (RJ45), RS232, Auxiliary and loop coax connection. AMBrc3 decoders do not have a USB B connection, instead an Ethernet 10/100 network connection is provided; this means that the decoder must be powered by a separate mains adaptor. This may be seen by many users of AMBrc as a backwards step but I believe that the power requirements of the new decoder are too great for USB. Ethernet does have its advantages over USB however, a more secure connection (will not drop out if the computer goes into power saving) and allows for up to four computers to be connected at the same time. Ethernet also allows the decoder to work independently of a computer to upload lap times via AMB's mylaps live service, just plug the decoder into a adsl/cable router, enter the mylaps username/password and your away, amazing! Apart from the my laps live service there is little practical difference between the AMBrc / AMBrc3 decoders, that latest features though will be useful for those that must have their results "live" on the internet. Chronit produced a system very similar to AMB's, but they are no longer in existence. KO Propo have released two systems onto the market, one works with Mini-Z cars and uses the signals emitted by the receiver unit to count the cars. The other system uses transponder type units (Called TD-1), powered by a free slot in the cars receiver. To change the transponder number different crystals are installed, so the system requires some driver involvement and a large collection of crystals, unless they have to be returned after every race. A transponder system is a significant purchase, make sure that the system you want to buy is suitable for your purpose, visiting another track might be a good idea to see the system being used. The diagram above shows the way a counting system will be connected (Resistor (A) may not be used). System 20 transponders continually emit a signal, each transponder number has its own frequency so the decoder can identify the car, inside the decoder there is a separate circuit for each transponder number. A transponder will be installed in each car, as the car passes over the loop it is detected many times, the decoder knows the time of the first detection and last detection and so can work out the time when the car passed over the middle of the loop. After a passing the time, transponder number and some other information is sent to the computer, the timing program then adds a lap, starts a cars clock etc. Race software will display the number of hits after a transponder passing (1 to 50), a very low reading may result in cars not being picked up and very high reading may lead to fantom passing's (known as ghosting). Many factors can effect the amount of hits including, car speed, width of loop, condition of cable, transponder mounting & the sensitivity adjustment(a dial on the decoder to adjust how sensitive it is to the transponders as they pass). AMBrc / Chronit systems use a single frequency and their transponders do not emit a signal continually. Instead hundreds of digital transmissions are sent every second with a random time gap between them, the transmission will include the transponders unique id and battery condition (in the case of rechargeable units). If two cars pass over the loop at the same time and transmit at the same time then the signal will not make sense to the decoder, because of the random delay the next transmissions will take place at different times allowing the signals to be processed. Signal strength, hits and also noise level (background interference) are all provided but a sensitivity adjustment dial is no longer required on the digital decoder. KO Propo's system works in a different way to AMB and Chronit because it uses RF rather than magnetic induction.